moved to www.skorchmag.com! : Goo-goo Ga-ga over Fashion! "Bibs aren't just for the kiddos anymore! No way!" Let me tell you, if I was sporting a bib like this back in the day, I would have been THE hottest kid on the block! For SURE! 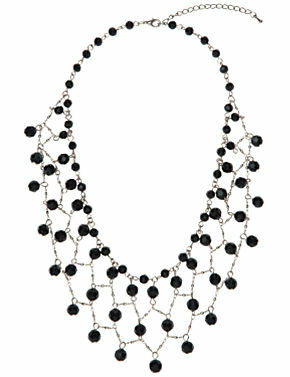 * snap* Bib necklaces are one of the hottest trending items right now and definitely one of the smartest. 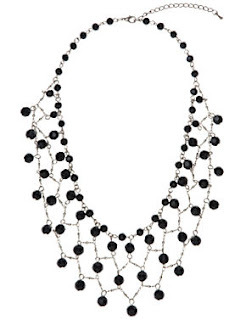 Bib necklaces are used to create an embellished neckline. Strap one of these bad boys on, and it will instantly transform that simple unit of yours into a runway show piece! Ow! I'm glad I had one available when I had to wear my little black dress twice in a weekend? Oh sure…like it's never happened to you? I was on a weekend getaway with some good friends. On our last night there, we decided to go to an All-Black party...sigh…unfortunately for me, I already wore my only black outfit the first night out there. Being that I was the only "endowed" chick amongst my girls, borrowing a dress wasn't an option. An accessory bib was the perfect accessory to make that dress into "another one". Oh yes…it worked out juuuust fine! 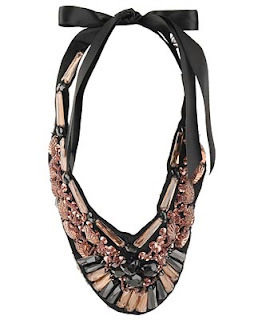 Bib necklaces are definite must have!